Now, who hasn’t heard about Jaipur? How many days are required to explore Jaipur is a common question posed by most travelers. They have often asked me to suggest an itinerary for a Jaipur trip. People interested in exploring beyond the standard tourist places can easily spend 5 days exploring this popular tourist city. First-time visitors should explore must-visit places in Jaipur rather than offbeat places unless their interest dictates otherwise. Two days are enough to explore important tourist attractions of the pink city. Following Jaipur guide will help you optimize your two-day visit to the pink city as a first-time visitor. Here is a list of places to see and things to do in Jaipur. The walled city area of Jaipur is the original settlement founded by Maharajah Sawai Jai Singh II. Earlier the walled city area was well marked but over the years with rapid population growth, it has kind of blurred. However, there are two ways in which you can identify the walled city area. One, the buildings follow the pattern of a single color – terracotta pink which lends it the name of the pink city. Two, there are entry and exit gates. In the past, before Indian independence, these Jaipur gates would close soon after the sunset and open around sunrise. It is no more a case now. These gates are a great reminder of a bygone period. You must cover the following places on this day. Starting with Govind Dev Ji temple, Jaipur City Palace, Hawa Mahal, Jantar Mantar which is a solar observatory, and a stroll through the old bazaar i.e. Johari Bazaar with a bit of shopping thrown in. A great way to start a day in India is usually with a visit to the temple; a custom followed by most Hindus. Govind Devji temple is Jaipur’s patron deity. Even though the temple is open throughout the day but one can have Darshan of Lord Govind Devji only during the pre-designated slots. You can check the current slots for the day online on their website. Mangala Aarti is definitely the best one to attend but this might be too early for you since it starts at 4.30 AM. You can either opt for Dhoop at around 7.30 AM or Shringaar at 9.30 AM. Please note that these timings change as per season. The Jhanki period is half an hour. The best thing to do here is soaking in the atmosphere. Many people claim that the atmosphere at Govind Devji temple is magical. I will leave this for you to decipher. There is an interesting history about how the idol of Govind Devji reached Jaipur from Vrindavan in UP. You can read this story here. The prayer hall of Govind Devji temple is one of the oldest and biggest pillar-less temple halls in North India. Also, the temple building is spire-less which is uncommon in Hindu temples. The Palace Of Winds or Hawa Mahal looks stunning in the morning with the soft sunlight illuminating the structure. The area around Hawa Mahal is congested and with metro work in progress, it witnesses traffic snarls throughout the day. The morning offers a good respite from the noise and traffic pollution. If you are in a mood for exploration, it’s a good idea to check out the building behind the Hawa Mahal facade. You can find the entrance on Tripolia Bazar near Badi Chaupar. Recommended for those who love architecture, exploration, and photo-opportunity. Also, it is the only way you can have a bird’s-eye view of the entire area. Another alternative is to visit Wind’s Cafe opposite Hawa Mahal. Jantar Mantar is a solar observatory which is almost 300 years old and still fully functional. Till date, the readings from these instruments match closely with modern gadgets. Out of three Jantar Mantar built by Maharajah Sawai Jai Singh II in different cities, the one in Jaipur is still intact and well-maintained. Although each instrument has an information board, hiring a guide is highly recommended as he can explain how each instrument functions in a better way. Another alternative is an audio guide. Jaipur City Palace is right next to Jantar Mantar, barely a few minutes walk from its exit. What are the things to do and see in City Palace? There are a couple of museums, Instagram-worthy gates to get yourself clicked, and interesting architecture. Have a look at this famed peacock gate in Pritam Chowk in Jaipur City Palace. Check out two huge silver urns used by the Maharajah to carry Ganga-Jal during his trip to England, more than a hundred years ago. Read What makes walk with Jaipur City Palace unique? Shopping in Jaipur is incomplete without a visit to Johari Bazar or Bapu Bazar. Bapu Bazar is famous for hand block printed fabrics, bed sheets, and dresses. It is also a popular place for buying handmade Jootis and Mojari in Jaipur. Alternatively, you can try shops in front of Hawa Mahal but they can be pricey because it is a tourist place. Johari Bazaar is famous for buying jewelry and Sari. It is best to buy from shops that sell to locals and not tourists. This can save you money. There are many upmarket stores in Jaipur but none of them are in the walled city area. You can find them in areas like C-scheme, Civil Lines and MI Road; I have not listed them here. The best itinerary for the day would be to start with Darshan at Govind Devji Temple, followed by Hawa Mahal, Jantar Mantar, and City Palace. All these places are within walking distance. Johari Bazaar and Bapu Bazaar are the most popular places to shop & are at a walking distance from Hawa Mahal. If you like to add more places to visit, you can add Galta Ji temple but you will need an extra 2-2.5 hours including the transit time. I don’t recommend visiting this temple after sunset as you won’t be able to experience its true beauty. Jaipur is famous for its forts and palaces. You can reach them via Amer Road and it is best covered together in one day saving you significant time. You will be visiting Amer Fort which is actually a palace, and Jaigarh Fort and Nahargarh Fort. On your way, you can also enjoy the great view of the water palace – Jal Mahal from the promenade running parallel to the road. Once you are done with these forts you can club either the Albert Hall museum or Chokhi Dhani ethnic village depending on your energy level and time availability. Start your sightseeing with a visit to Jal Mahal or Water Palace on way to the Amer fort. The entry to Jal Mahal is currently not permitted because of the long-pending court case of Jal Tarang project. However, you can surely enjoy a stroll along the promenade running parallel to the road and get your pictures clicked with the Water Palace or Jal Mahal. Amer Fort is one of the most sought-after experiences of Jaipur. Many tourists like to undertake elephant safari and consider it a prime attraction of Amer Fort. Lately, many people are demanding an end to the elephant ride at Amer Fort because of animal cruelty. I have a full post on things to see and do in Amer which is an exhaustive guide. 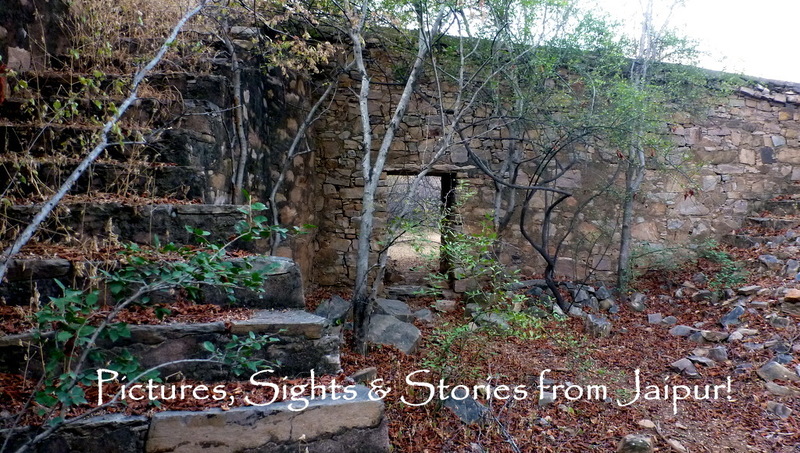 Many foreign tourists give Jaigarh a miss because visiting three forts gets overwhelming. However, Jaigarh Fort is popular among Indian tourists. It is massive and was built to give security to Amer. Things to see here include, Jaivan, the world’s largest cannon and armory museum. I would like to add that one should not miss the cannon foundry which is India’s first & oldest and the stunning views of Amer from the Jaigarh observation point. Nahargarh Fort is one of the most popular places among the locals because it offers stunning views and a great drive. Nahargarh & Jaigarh Forts is on the same hill but on different ends. Nahargarh Fort overlooks Jaipur city & Jaigarh offers stunning views of Amer town. It has a palace section which was added later at the end of 19th century – Madhvendra Bhawan. You can enjoy some stunning sunset views from Nahargarh Fort. I recommend covering this one in the end. Read my post on sunset from Nahargarh Fort. A couple of new additions have been made by way of a wax museum and modern sculptures in the Madhvendra Bhawan. Padao restaurant is a popular place to have a beer among the locals. An upmarket restaurant “Once Upon a Time” occupies a part of Madhvendra Bahwan. Albert Hall Museum is located close to Johari Bazar in Ramniwas garden. The foundation of this building was laid on 6 February 1876 by Prince of Wales, King Edward VII, which is why it is named after him. The decision to convert this building into a museum was taken much later. It was converted into a museum in 1886 AD. It is not a huge museum, but it boasts of some unique collections. Among the most prized is Egyptian mummy. It is one of six Indian museums having an Egyptian mummy, a privilege very few museums across the world have. Therefore, Albert Hall is considered one of the prominent ones. I suggest you opt for the night tourism plan as it saves you daytime to explore other monuments. Under night tourism initiative, Albert hall museum is open from 7 PM to 10 PM. The building is beautiful as it is built in the Indo-Saracenic architecture style which is a blend of Mughal, Rajput, and Gothic styles. Chokhi Dhani is a replica of ethnic Rajasthani village so one can say that it is a theme based dining in a local village setting. They also run a resort in this complex. It is best to visit this place from 7 pm to 10 pm. Chokhi Dhani is 22 KM from the city center and it takes 45 minutes to reach. Hand-painted Tuk-Tuk or Auto Rickshaw as it is locally called. What is the best transport to explore Jaipur for a two-day plan? Don’t hire a cab for day 1 when you will be exploring sites in and around Jaipur City Palace. Opt for either Uber or Ola cab as you only need a drop to City Palace Complex. Alternatively, you hire a tuk-tuk/ autorickshaw or a drop facility by way of a taxi from your hotel. On day two, you will need a dedicated taxi. Taxi is usually available for a full day, 80 km plan. Even Ola and Uber also offers a similar option. Stay away from sweet sounding deals thrown in by tuk-tuk and taxi drivers. The talk actually begins by tempting you to take to one of the gemstone factory or carpet factory and so on. You will be tempted by cheap prices. At times, the “dealer” will force you with “just have a look” if you refuse. Most factories are tourist emporiums and sell inferior products at astronomical prices. These “dealers” earn hefty commissions on sale to the tourists that they fetch. Drivers are often paid handsome amount just to fetch prospective buyers. There is no point in “having a look” and wasting your time. Many emporiums have skilled salesman to convert non-buyers into a buyer. You can find many such stories on TripAdvisor forums. People have paid hundreds of dollars for something that cost US$ 1 or 2!! It is better not to get swindled when you don’t understand quality. Some emporiums in Jaipur have even sold replicas as antique and have been reported even in the newspaper. Tourism is a big business and some people really know how to fleece money from gullible tourists. This is true for every tourist city in the world be in Istanbul, Paris, Rome or Barcelona. Places to eat in Jaipur – There are many popular places to eat in Jaipur. On day one, you can opt to eat at LMB in Johari Bazaar which is popular among tourists or at Baradari in Jaipur City Palace. If you prefer anything beyond these two places, the nearest options are MI Road and C scheme. Note that this will involve significant time and you may have to rework your itinerary. Surya Mahal is a popular fast-food joint on MI Road. Another popular option to try street food is Masala Chowk which is barely a few minutes away from Johari Bazaar and has some very prominent & old names of Jaipur. You can sample some of the most popular street food in a centrally located place. Now can you beat that? Read: What makes Masala Chowk so popular? On day two, there are limited options for places to have lunch. Few tourist-oriented restaurants on Amer Road are the most sensible option but I can’t recommend any. Apart from these, you can find a few shacks style local food joints near Amer Fort. If you want to try an authentic experience, how about trying a few Chai Bars? Jaipur has cool places that serve Chai – Indian style tea. Tapri Central and Chaisa are both popular among the locals. Read What tea cafes are popular in Jaipur? Bar Palladio and Shikaar Bagh are some of the most popular places to unwind after a hectic day in Jaipur. Narain Niwas Hotel near Police Memorial is where you will find both. Missing your daily dose of caffeine? Try Curious Life Coffee Roasters, the best place for coffee in Jaipur. You can choose the origin of your coffee beans and the method of the brew. The owner has a reputation for being picky and their selection is one of the best in India. In a mood to experiment food? Try the vegetarian fine dine experience at Meraaki Kitchen. The menu is curated by Master Chef India winner – Neha Deepak Shah who is also one of the owners. They serve fusion food – popular dishes with a twist. Read Meraaki Kitchen | The best fine dine restaurant in Jaipur. Why is Jaipur called The Pink City? It was during the reign of Maharaja Sawai Ram Singh II that Jaipur was painted pink. There is a popular story behind it. Declaration was made that Prince of Wales, King Edward was to visit Jaipur in 1886 AD. The king decided to welcome the visiting dignitaries by painting the town with a single color. Some people say that experiments were conducted by painting different colors in different markets and ultimately terracotta pink was chosen. When the Prince of Wales noticed the color scheme, he exclaimed – Ah! The pink city. This color scheme was chosen permanently, and that’s how Jaipur was called The Pink City! November to February is the best season to visit Jaipur due to suitable climate conditions. I am sure that this two-day itinerary for Jaipur Trip will help you to explore the pink city in the best way. The way you have organised the places to check out. That is quiet interesting and that too with a map for the walled city. I spent two days in Jaipur as I have mentioned earlier in your posts. Visited all these except Govind Devji temple, Jaigarh Fort And Nahargarh Fort. In fact I didn’t even know about the first two. Amer Fort I loved the most in Jaipur. Great info and definitely this post should help a lot of people struggling to juggle things into two days! Superb list! Getting a cut and paste on the website is very easy, getting the real info from someone who has gone through it is priceless. Whenever I travel I search for such info and very rarely I find the genuine info like this. Great job! With such a precision you wrote is what amazes me.Next year I will surely go to jaipur and take you as a guide Arv. Your blog is my guide to Rajasthan. well, looks like you found something to your liking. Most tourists simply rush through these instruments. I guess the mathematics must have harassed them a lot during their primary school years! Your visit must have been many years ago, Cheryl? After reading so many posts on Jaipur, I feel quite familiar with the sights of this marvellous city in India. I like the way you give advice what places to see and what places to stay away from. Interesting is the hint to stay away from touristy areas, as they tend to be pricy. Great photos as always, Arv! This is a wonderful post for a first time visitor. I like the warnings you have issued regarding fleecing especially foreign tourists who believe people easily. Even local guides make the best of their gullibility. The picture of Albert Hall Museum is a masterpiece! Such detailed post.Definitely showcases places whicb I have not been in my two times trip…Well done Arv! So which all have you explored, Surabhi? Arv, great post. I stayed three days in Jaipur and that wasn’t even close to enough. Well not only because of the tourist places, which I saw some of your suggestions, rather than just strolling around the city with my camera without certain destination, wandering around in some hidden alleys, just following my camera’s eye, but’s that just because I am curious person and a photographer. Cornelia, Let me admist this list is for the tourist and not for explorers. For explorers, I will simply provide a landmark and leave the rest for him or her to uncover. You are right, for a curious person 2-3 days is too less given the fact that there is far too much happening around. So did you explore all the attractions? Thank you Arv, certainly I can’t agree more with you. Oh, I didn’t explore all the attractions. That’s a great post, Arv. So much to see, and you’ve covered most of the important things. I’ll look forward to that, Arv. Great once again to go through this very detailed guide for exploring Jaipur in a short span of time…..great work, JP. Having been to Jaipur your post brought back fantastic memories. It is clearly written and very descriptive. No I haven’t written about it as it was before I started my blog. I enjoyed our trip to India a great deal. Everytime that I read your posts, I feel like visiting Jaipur. You bring heart and soul to the piece through your writing. Happy to know that Jaipur is on your list of places to visit, Sheryl! Have you ever been to India? Albert hall ka timing Kya hai? A very thorough, thoughtful, and inviting post! Anyone planning a visit to Jaipur would benefit from your wonderful information. Appreciate your feedback and views. Your post and photos take me back to when I was there in 1985! Awesome blog! Jaipur is definitely on our list, so we’ll have to refer to this again! I’m sure it will come handy whenever you are planning a trip.